With telescoping and expandable bases, you can adjust not only the height of Haworth Hop tables, but the width as well—from 43-70 inches. 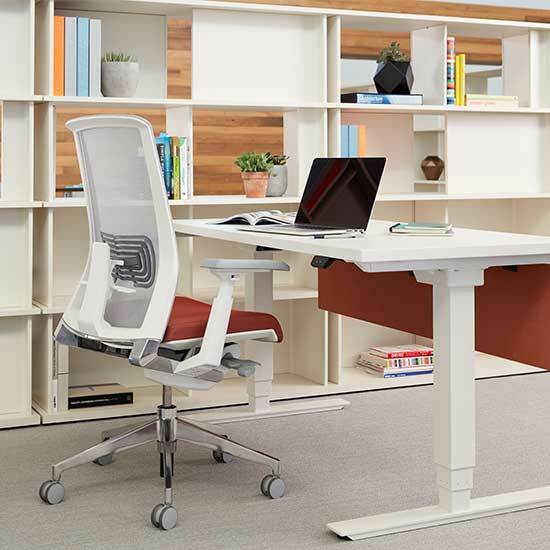 That means if you need a table with a different-sized top (up to 46 x 84 inches), it is ideal for retrofitting your existing fixed height tables. Even with the added weight of a larger worksurface, you can count on the expandable base to support it. Also available is an innovative powder coating process which provides a durable, seamless top without edgebanding. Dependable and affordable, Hop doesn’t compromise when it comes to performance and quality. 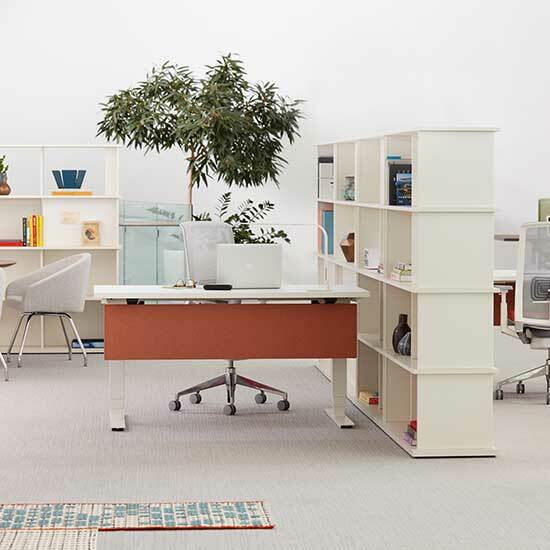 Hop’s adjustment control system lets you position your desktop exactly where you want it. Using two dependable motors and a sophisticated track and guidance system, the mechanism lifts and lowers at an efficient 1.4 inches per second. Operation is whisper-quiet—just 50 decibels. The maximum power usage by the Hop table while in operation is 4A /128 W. When not in use it consumes only 0.3 Watts. 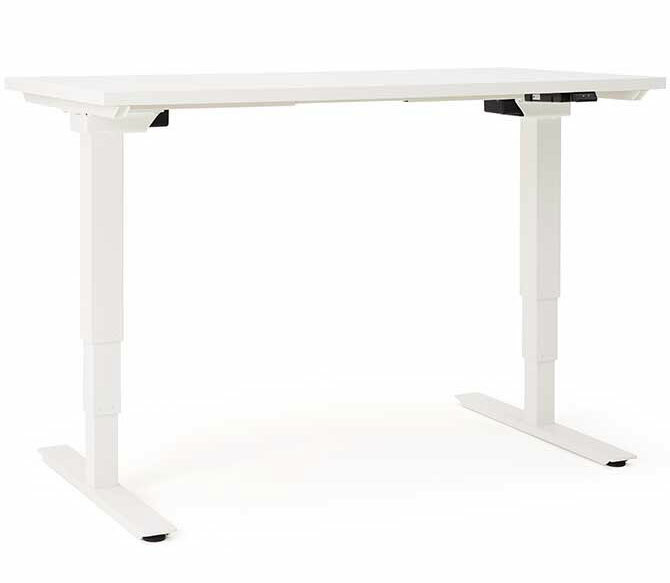 The Hop table supports up to 250 pounds, including the worksurface, and meets BIFMA standards. It has a height adjustment range of 25.7 – 51.3 inches. The base width expands and contracts to accommodate various worksurface sizes and shapes. Made from steel, bases come in five colors: Metallic Silver, Metallic Champagne, Plaster Smooth, Charcoal, and Smoke. 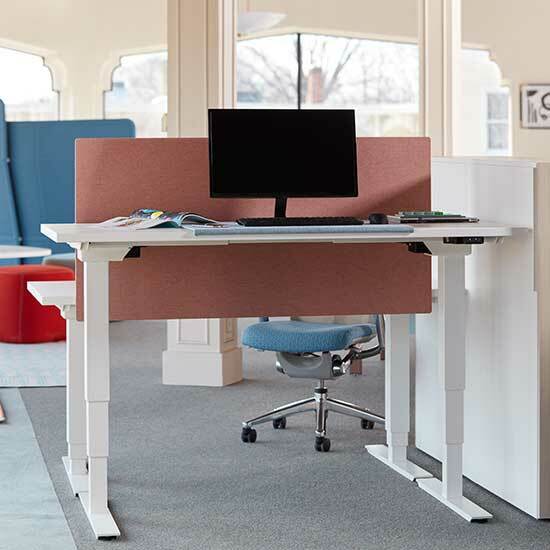 Hop worksurfaces are available in Haworth finishes, including laminates, veneers, and nine powder-coat options. Choose from five shapes and two edge options: edgeband and powder-coat to be used with power-coat tops only.